Shooting a gun fast is a LOT of fun. Shooting a gun fast and accurately, like in this video a few years ago where I shoot a 6” group with .14-.18 splits with a Glock 26 is ridiculously fun. Unfortunately, most of the advice on how to improve trigger speed and trigger finger isolation simply doesn’t work. These are all things that shooters try when they weren’t taught a systematic, efficient approach to increase trigger speed and trigger finger isolation…because the process simply didn’t exist in an easy to get way until recently. I did all of those things, and they’re not bad, but they didn’t give me the results I wanted. So, I hacked the process. “Reverse engineered” it, so to speak. You see, trigger speed is a function of how quickly you can perform a precise, coordinated, and isolated motor movement. When you’re trying to shoot fast and accurately, it’s a matter of how quickly you can move your trigger finger back and forth without disturbing sight alignment. Like I said, until recently, the information on how to improve with anything other than a brute force approach simply wasn’t available to the majority of shooters or instructors. “Concentrating” “getting stronger” and “doing lots of reps” was the best approach available. Fortunately, modern brain science gives us a faster, easier, simpler answer. First, your brain has 2 maps of your hand…a sensory map and a motor map. The more detailed and granular the sensory map is, the more precise you can be with your motor output. For a lot of people, low detail on their sensory map of their hand is slowing down their trigger speed. So you want to do things to improve the sensory map of your hand. 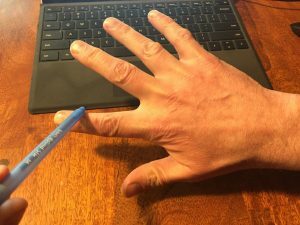 Or the “how many fingers” drill from the 3-things PDF that you can sign up for on the right side (laptop/tablet) or bottom (phone) of the page. A few seconds of these drills can have a marked, immediate positive impact on shooting ability if your brain is craving that input. Next, you want to improve the mobility of your finger joints. 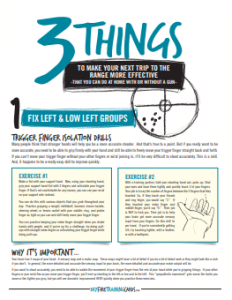 And here are 3 quick trigger finger mobility drills to help increase finger mobility. Finger curls, finger waves, and finger circles. Third, you want to improve trigger finger isolation…that’s the ability to run the trigger finger without the other fingers or the wrist getting involved. When you try to isolate the movement of your trigger finger and other muscles get recruited into the process from your other fingers or wrist, it’s called sympathetic movement. Sympathetic movement can throw off your sights enough to miss a man sized target in your kitchen. The speed that you’re trying to move. Here’s a drill that will quickly help you with trigger finger isolation. First, you’re going to need a fully articulating trigger where the slide doesn’t need to be racked between dry fire reps. The easiest solution that works in any gun is Dry Fire Cord. Dry fire cord blocks your chamber, making it incredibly difficult to chamber a live round AND holds the slide just far enough out of battery to give you a fully articulating, resetting, non-clicking trigger without having to rack the slide between dry fire reps.
You can also use a SIRT Dry Fire Pistol, airsoft, pellet, or bb replica trainers, like the Glock 19 CO2 BB gun from Umarex that I’m going to demonstrate with. If you have the option, use the lightest possible trigger you can initially. This isn’t a strength drill…it’s a muscle speed and coordination drill. You want to get the lifting muscles and stabilizer muscles working together as smoothly as possible so that you can run the trigger quicker and quicker, with a firmer and firmer grip, without disturbing sight alignment. If you want a REALLY eye opening experience, use an always-on laser sight or use a rubber band to attach a laser pointer to the slide of your pistol (wrap the laser pointer in masking tape so it doesn’t mar or scratch your gun), stand 10 or so feet away from a target and do the drill to find the maximum speed and firmness you can use before the laser starts jumping all over the place. That’s the speed part of the equation. If you want to control that speed…and spend as little training time and money as possible to do it…you’re going to want to work on vision speed, draw stroke efficiency, recoil management, and following your sights in recoil. Most shooters never work on these skills because the information is next to impossible to find and it’s ridiculously expensive and time consuming to train these skills with live fire. But this training will take you through a step-by-step process to nail down these skills and more so that you can be lightning fast AND accurate in only a few minutes a day, a few days a week. We’re able to get these radically different results in less time than what’s possible with traditional training methods because we use radically different training methods. It’s smarter training for smart shooters like you.